One of the 90's most beloved brands makes it's triumphant return to the hobby this April. 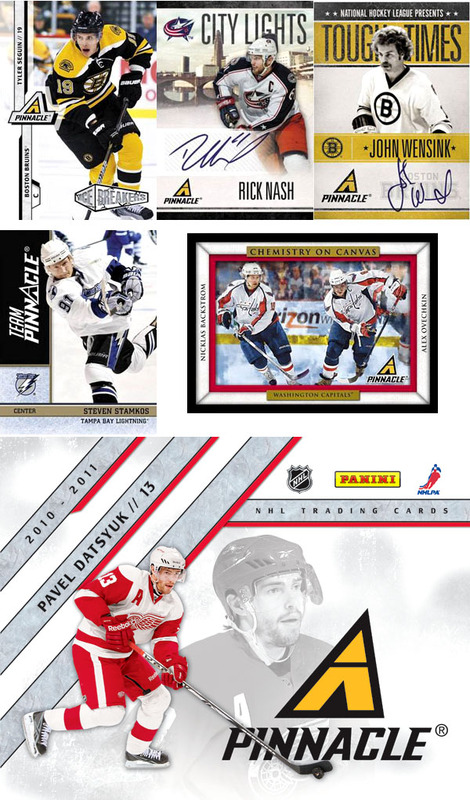 2010-11 Pinnacle Hockey promises plenty of old favorites such as Team Pinnacle inserts as well as some intriguing new additions including autographed and memorabilia cards. Each hobby box of 2010-11 Pinnacle will carry a box price of around $80-$90 and delivers 4 hits, 4 Ice Breakers Rookie Cards, 4 Museum Collection Parallels, 1 Artist's Proof Parallel and 1 Tough Times Insert Card. Four autograph or memorabilia hits, including Pinnacle Threads, City Lights, Pinnacle Penmanship, Rookie Team Pinnacle Signatures and many more! 50 Ice Breakers Rookie Cards featuring some of the hobby's hottest freshman skaters including Taylor Hall, Jordan Eberle, P.K. Subban, Jeff Skinner, Tyler Seguin, Nazem Kadri, Cam Fowler, Sergei Bobrovsky, Magnus Paajarvi and more! Look for 20 different autographed Ice Breakers rookies! Tough Times insert return, this time honoring the most intimidating hombres of the 1970s, including John Wensink, Dave Schultz, Willi Plett, Nick Fotiu and more! The return of a 90's hobby favorite Team Pinnacle, which is bolstered by the addition of Rookie Team Pinnacle Signatures, which feature crisp on-card autographs of the hobby's hottest first year skaters! City Lights Materials highlight hometown pride with a cold as ice swatch of game-used jersey set against a backdrop of each city's skyline! Overall a very nice product. I like the design and the chance for some nice cards with low print runs, and it’s cool all the blasters i’ve seen opened an i’ve opened myself (about 2 or 3) have had a jersey or in some rare cases an auto. Only things I did not like was some of the players on the city lights jerseys and the fans of the game cards. Overall it’s worth buying a box or blaster box! Are all jersey cards numbered to 499 unless a patch which is to 25? It’s weird cause I’m reading no parallels yet I got a City Limits Matt Moulson to 99..
City Lights Materials cards are numbered to 499 or less. Moulson base relic has 99 copies.